Organic Reaction Flashcards Version 2.0 Is Here! Do you ever study by making flashcards of reactions? 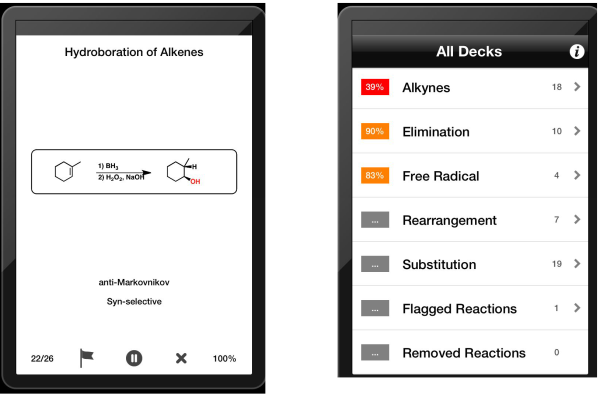 You might recall that a few months ago Rich Apodaca (of Metamolecular) and myself released the first version of The Organic Reactions Flashcard App for iPhone, a mobile app for learning organic chemistry reactions. some way of recording their progress. Ask and you shall receive. Today, Rich and I are excited to announce the newest version of Organic Reaction Flashcards, and it is significantly better in every way. Our goal was to build a reasonably comprehensive set of flashcards for first semester organic chemistry. With a total of 100 individual reactions covering 8 major categories, I believe that this version of Flashcards lives up to the requirement. 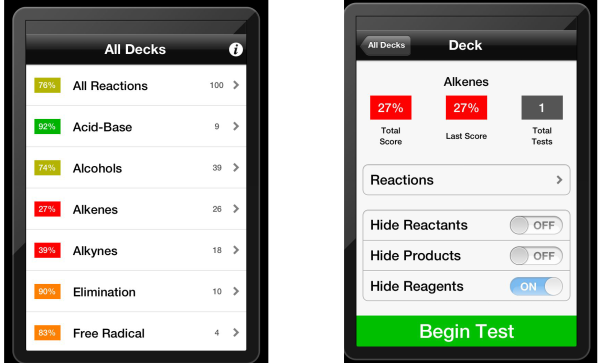 The content of the app covers the reactions covered in the first 10 or so chapters covered in most organic chemistry textbooks. There’s also much better organization. The first version of Flashcards had no set organization whatsoever – it was just a stream of flashcards. In this version, the 100 reactions are arranged into categories according to functional group class, making chapter-specific testing a snap. So if you want to test yourself only on alkenes, or just on rearrangement reactions, that’s now extremely easy to do. Is a certain reaction is giving you a hard time? Flag it! This puts the reaction into a custom deck that you can test yourself on at will. When you feel that you understand the reaction well enough, simply un-flag to remove it from the custom deck. Furthermore, it’s likely that some of the reactions in the app are reactions you might never see in your course. For example, maybe you don’t need to know the free-radical reaction of HBr to alkenes right now. If you don’t want to have this particular reaction come up, it’s easy to remove it from circulation with a simple tap. If things change and you later realize you do need to test yourself on it, bringing it back is easy to do. The testing aspect of Flashcards is one of its most impressive features. After you see a flashcard, the gesture you use to advance to the next card tells the app how you did (up or right for correct, down for incorrect). Flashcards keeps score. With a series of color coded lists, the app tells you what you’re doing right and where you need to improve. See the list of reactions below: it looks like we’re doing OK with acid-base, but our alkene and alkyne chemistry needs work. Furthermore, each reaction represents three different testing opportunities – to learn the starting material, reactant, or product. When setting up a new test, you can choose which of these variables you’d like to hide. This lets you learn new reactions forwards and backwards (or both at the same time!) depending on your preference. 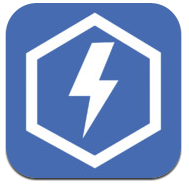 …you should visit the App Store and download the Organic Reaction Flashcards app. If you have a chance to use it, please rate it and let us know how it works for you. We’d like to know how to make it even better. One note – unlike the initial test versions, Organic Reaction Flashcards is no longer free. This is a genuinely useful stand-alone app that required significant development time. Charging for its use reflects that. Your support will help us toward the goal of building other great apps for learning organic chemistry. 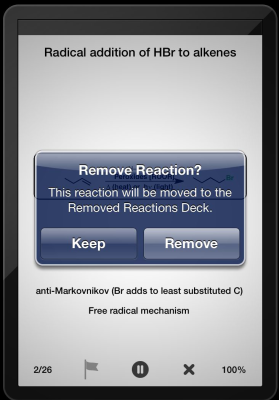 Any chance this application will be updated with the mechanisms for the reactions? Great potential for this app!! Is there any possibility for android users to have a version of this app in Goolge Play?? How can I get this version for Android? It would be nice ti be able to use it in my s4. Orgo 2 Rxns and Mechanisms! Will this be available for Android any time soon?